These Baja fish tacos with citrus slaw and a spicy garlic-lime sauce are what my family loves to tuck into when a classic, west coast-style beach meal is what we crave! We love to make special dinners on Saturday evenings whenever we possibly can. It gives us a chance to not only eat a delicious meal together as a family, but to connect, laugh a little, and share stories from our week while we enjoy that meal. And these dinners are especially poignant to my husband and I since our son no longer lives at home with us. Although he’s a Marine, he happens to be stationed locally, and comes home on the weekends whenever he can. That being said, we truly love this precious time together to regroup and visit with each other; and, to “refuel” our son after an often-challenging week of physical and mental stress, feeding the bottomless pit of an appetite he has these days. 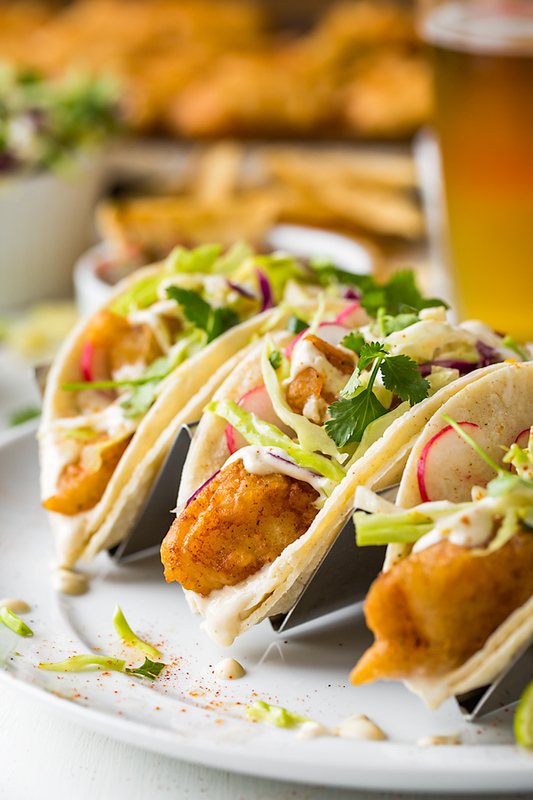 When I asked our son a few weeks back what he’d like for our next family dinner, he asked for Baja fish tacos—the kind that are beer-battered and fried to crispy, golden perfection, with some crunchy slaw and a garlicky, spicy sauce to douse everything in. And I was more than excited to oblige! That following weekend was a three day weekend for our son, and we made those Baja fish tacos—made a huge batch of them, because I wanted all of us to have plenty and perhaps even have some as leftovers. And that’s exactly how it played out. We all ended up enjoying them so much that we ate them for the next two days straight after that dinner, enjoying every bite until not a scrap was left, not tiring of them one bit. Talk about a meal we could eat for days! 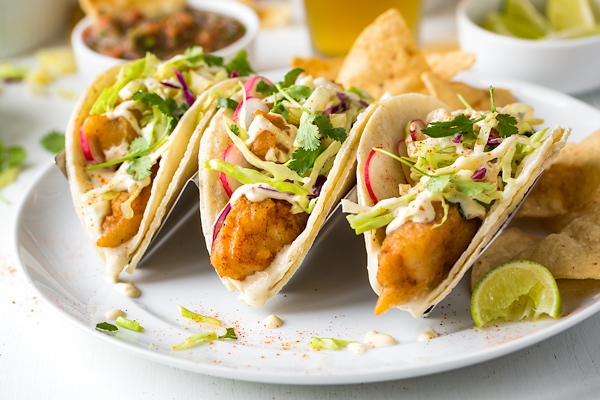 Because Baja fish tacos are dipped in a batter and lightly fried until crispy, the type of fish that is used is important. A firm, flaky white fish is best for these tacos, and cod fits that bill perfectly. Halibut is wonderful, too, but is quite a bit more expensive; and since cod is so similar and can take on a beer-batter as well as halibut, it’s the best choice, in my opinion. You’ll also need a fresh, crisp, and tangy slaw to go along with your Baja fish tacos. A simple combination of thinly sliced green and red cabbage tossed with a bit of olive or avocado oil, some fresh citrus juice, and a couple of other simple ingredients pairs deliciously. In my opinion, the sauce is the next most important thing after that crispy fish! When loaded liberally with garlic and a hint of lime, a spicy, creamy baja fish taco sauce totally completes this meal. Begin by cutting your white fish into short strips or bite-size chunks, and marinating it in a simple seasoning to impart even more flavor before frying. Next, prepare your sauce by adding all of your ingredients to a food processor and processing until smooth and creamy. And if you have a squeeze bottle, add the sauce to that to make it easy to drizzle over top of the fish tacos. Then, prepare your slaw by adding all of the ingredients to a bowl, tossing to combine, and placing into the fridge to keep cool and crisp. Finally, prepare your simple beer batter and bring your oil up to temperature (about 365°). 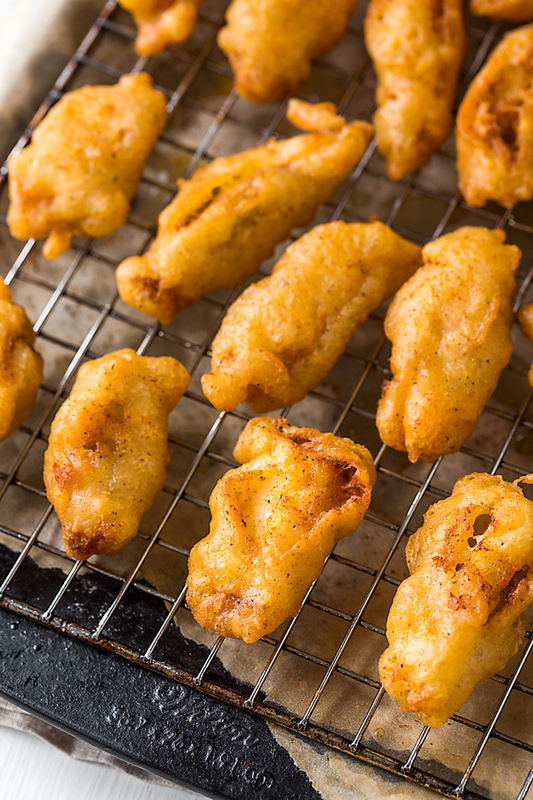 Dip each piece of fish into the batter and carefully fry (in batches) for a few minutes until golden-brown and crunchy. Keep warm on a wire rack. Now all that’s left to do in order make these scrumptious Baja fish tacos is to stuff all of those delicious elements into your warm corn tortillas, along with a few sprigs of fresh cilantro and a squeeze of lime. And last, but not least, enjoy! Prepare your slaw and your sauce before frying your fish: Having all of your other elements ready to go before you begin battering and frying your fish is essential. Have your citrus slaw prepped and cold, as well as your baja fish taco sauce and any other finishing touches. 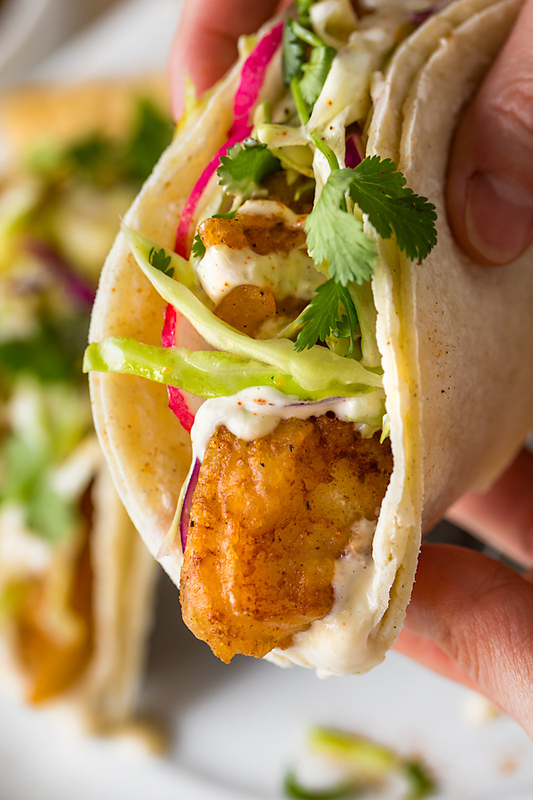 Firm, flaky white fish is best: Cod is a cost-effective and perfect choice for these fish tacos—it takes on the flavors from the marinade, and keeps its shape and texture once it’s fried. Corn tortillas are traditional: I would recommend that you use a very soft corn tortilla for these tacos, and double up so that they don’t split and fall apart (Mission brand “super soft” are great.). However, we actually often use flour tortillas (the fajita size ones) because we prefer the texture and the convenience of these not falling apart on us. The choice is yours! Prepare your batter just before frying: I find that gently whisking the beer into the seasoned flour and preparing the beer batter just before frying creates a crispier batter because the carbonation is still very fresh. You can prepare the batter ahead of time, but expect that it may “flatten” a bit. Other delicious finishing touches: Some other tasty touches to add to your Baja fish tacos are fresh, sliced radishes, fresh cilantro leaves, and a little squeeze of a lime wedge! Reheating your tacos for leftovers: We use our toaster oven set to 400° and bake the leftover battered fish until hot and crispy—it reheats really well. Then, simply warm up your tortillas, and assemble your tacos. 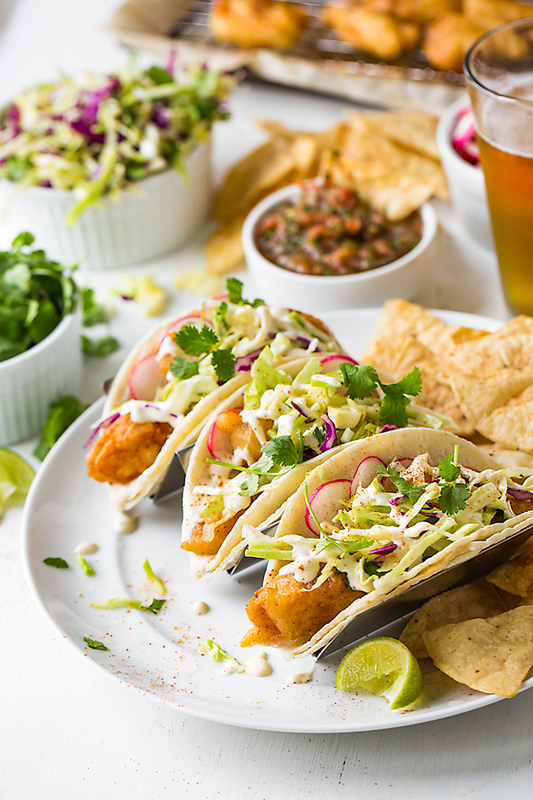 Light, crispy and fresh, these scrumptious Baja fish tacos loaded up with beer-battered cod, tangy citrus slaw and a spicy garlic-lime sauce are a delicious take on a classic west coast beach favorite! –Prepare your spicy garlic-lime mayo by placing all ingredients into a food processor and processing until smooth and combined; pour into a bowl, or into a squeeze bottle, ideally. –Prepare your citrus slaw by whisking together the orange zest, orange juice, lime juice, pinch of salt and pepper, agave or honey, and oil until well-combined (you can also shake these vigorously in a small mason jar for convenience), and set aside for a moment; add both of your shredded cabbages and the cilantro into a medium-size bowl, and toss the dressing you just made with the cabbage/cilantro; keep cold. –To prepare you fish tacos, add your cod pieces to a bowl and season with a couple of pinches of salt and pepper, plus the cayenne, cumin, coriander and garlic powder; allow them to marinate for a few minutes while you get your oil ready and prepare to fry. –Prepare a baking sheet with foil and a place a wire rack over top (if you have one) to hold the cod once it’s been fried; next, add enough oil to a deep pan or a medium-size pot so that the fish can be submerged when you fry it (about 3 cups), and bring it to 365°. –While your oil heats, whisk together the flour with a couple of pinches of salt and pepper, and slowly pour in the beer and whisk just until smooth; once the oil is hot, dip the pieces of cod into the batter and fry in batches (it took 3 batches for me) for a 3-4 minutes or until golden-brown. –To assemble, add a couple of pieces of the fried cod to the bottom of a couple of corn tortillas, top with a generous amount of the slaw, add in some radishes (if using), drizzle the spicy garlic-lime sauce liberally over top, and finish with some extra cilantro and a squeeze of lime. Looking for more taco recipes? Check out these Beef Street Tacos, or these Shrimp Tacos! Oh Ingrid, these look amazing!! Can’t wait to make these. I fell in love with fish tacos the first time I tried them at a restaurant in California. Hi sweet lady, great to hear from you! I know you’re a Cali girl at heart, and I can imagine that you loved these when you lived out here…so preparing these in not so much an option, but rather a must! I know the ingredient list may seem a little daunting, but many are repeat ingredients; and I promise you won’t be sorry you took the time to prepare them! I hope they offer you a little taste of the place that is near and dear to you, take you back to the special flavor of beach-y, west coast-inspired food. Much love, and hope you and your hubby are well! 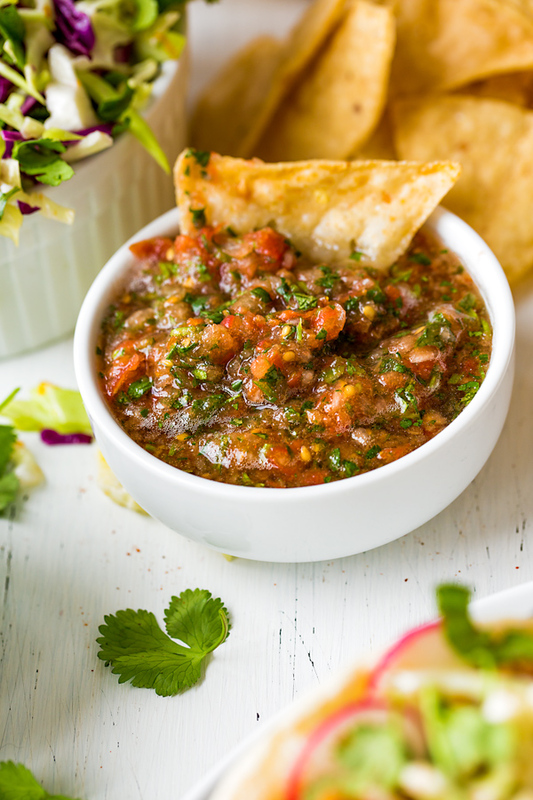 Are you sharing your recipe for the beautiful salsa shown in the above pictures? Looks wonderful! Here’s the basic run down: roughly chop up about 6 campari tomatoes (8 if they’re particularly small), roughly chop up about 1/2 an onion, take a big fistful of cilantro leaves (I love cilantro so I add quite a bit), some red pepper flakes (or jalapeño if you have it), squeeze of lime and a couple of good pinches of salt to taste, and throw it all into your food processor and process until fairly fine (restaurant style) like in the photos. That should do ya! Hope you enjoy! Just made these, and they are so good. I don’t believe in changing recipes; but I used Greek yogurt instead of sour cream (it’s what I had on hand). These are the best baha-style fish tacos ever. This recipe will be a regular in my home from now on. Grazie mille! 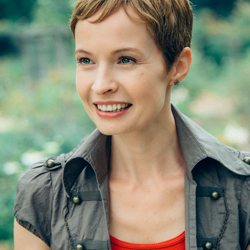 Hi Cyndi, I’m so excited to read that! I’m thrilled these were good enough to make a “regular” appearance on your dinner table from now on, and I’m so glad you shared your experience with me. (And the Greek yogurt will definitely do in a pinch, just fine!) Happy cooking! Made these last night and everyone loved them. They are so being added to our dinner menu, by unanimous agreement. I am from L.A. and grew up visiting family in Ensenada, so when i had a craving for fish tacos, i tried your recipe. This satisfied my craving, hit the spot. Thanks for sharing the recipe. Hey JoJo, my absolute pleasure! Thank you so much for sharing this with me, and I hope you enjoy these any time you crave a taste of your time visiting with family. Made these last night. Amazing. Everyone especially loved the slaw. I also made some pickled red onions with it that gave it that extra kick. 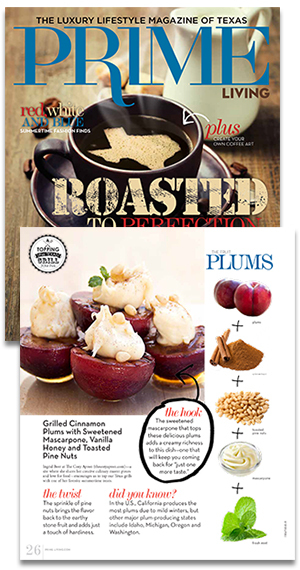 Jennifer, thanks so much for sharing your experience with the recipe! So glad it was enjoyed by all! The pickled red onions sound like a wonderful add-on—perfect! To keep things simple, I would advise you leave out any cayenne pepper or anything else that would add any heat to these, and you’ll be fine. Hope you enjoy! yummy fish tacos. I will definitely keep this recipe on hand. Enjoyed by 30 seniors today, everything was great, batter, slaw and sauce. Thanks, will do it again! Happy these will be on repeat for you!